Various leather paring knives: Far left George Barnsley English paring knife. 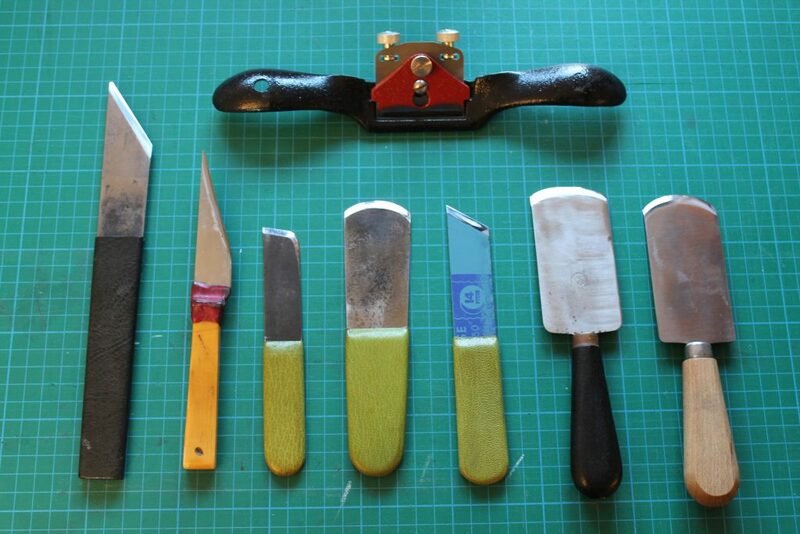 Over the last few years I have spent many, many hours researching bookbinding knives: I have looked at the wide variety of styles available and their historical usage; I have made my own blades which are suitable for book conservation; and I have also learnt how to sharpen them efficiently and taught others how to do the same. So reflecting on this work I have recently been inclined to reconsidered the traditional English paring knife. There are two points that intrigue me, the first being sharpness. I have recently given a number of workshops on leather-paring and part of the day is an appraisal of the students’ tools. So far nobody has yet presented me with a sharp English paring knife! Now I suppose that isn’t that surprising; what is interesting though, is that it wasn’t just the well-used knives that were blunt, the brand new ones were too… so why is this, surely suppliers should sell sharp knives? To understand what is happening here we need to consider the history of traditional hand-tool manufacture. If I may digress slightly… a while back I bought a billhook, It’s a handsome thing, hand-forged by Morris & Son’s, a family company in Devon, and it is a-cut-above many others which are simply punched out of plate steel. When it arrived I was delighted and I took great satisfaction in sharpening the roughly ground edge; however, recently I looked at some reviews online and was dismayed to see that some were less favourable citing the lack of sharpness. Morris & Sons, like those making English paring knives, have been making cutting tools for the trade for years. Their customers were proficient, and part of their training would be to maintain and sharpen their own tools. I believe that it was never expected that specialist hand edge-tools like these, would be supplied with a completely finished sharp edge; those using them would not consider sharpening the job of the manufacturer, and may even prefer to do this themselves as each tool would be personal to each trades-person. So the manufactures are just doing what they have always done: Morris & Sons are providing tools for farmers and hedge-layers, and the tool makers in Sheffield are providing English paring knives suitable for trade bookbinders. It is the consumer that has changed with a shift towards less skilled amateur crafts. The second point I would like to consider is the hardness of the steel. There has been a recent trend towards specialist paring knives made from harder and harder steel, and it would seem that in many ways this makes perfectly good sense. A harder tool gives a more durable edge; however, to some extent this has proved counter-productive as it has given less incentive for people to learn to sharpen their own tools. Of course, even knives made from those steels which are around 62 Rockwell or higher will eventually dull and will also need sharpening, so ultimately this doesn’t by-pass good sharpening skills. Traditional English knives, like those produced in the 20th century by George Barnsley, may then, be judged to be poor quality as the steel is relatively soft? Well I believe that this isn’t the case. Many 20th century bookbinders were producing very fine work with these knives; they would have accepted that a paring knife needed sharpening every time it was used. Manufactures also understood this; the traditional English knife is long, providing sufficient steel for many years’ worth of sharpening. I’m not arguing that any style of paring knife is better than any other – they all have their applications. I was though, wrong, when I judged English knives as poor quality; they are simply a tool which requires understanding and suitable up-keep. I can get a razor-sharp edge on my Barnsley English knife, but it does require regular honing to maintain. At the time of writing J. Hewit and Sons are selling an English paring knife for less than £7.00. This is fantastic value; at this price can we really expect the manufacturer to sharpen it for us as well? Rockwell is a recognised scale for the measurement of hardness. Thank you for that well written thought piece. My mentor joked that he became a tool sharpener who performed conservation and repair in his spare time. He was emphasizing our responsibility we had to our tools, and to ourselves. Here is an example of a negative review of the English paring knife taken from J. Hewit and Sons website. As discussed in my blog I think that this view misses the point.